The orbital aero model calculates one force I'm calling "Direct" - frictional force. When two bodies are in contact with each other, they can produce a frictional force. 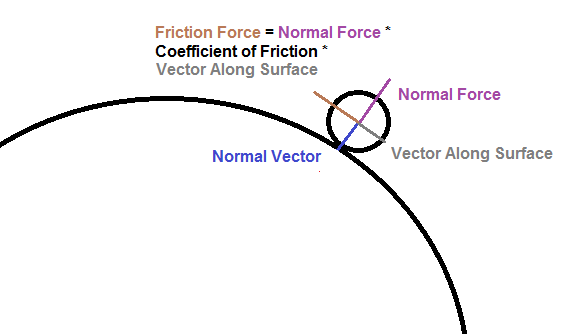 Friction force is calculated by the normal force between the two bodies multiplied by a coefficient of friction. The coefficient may be static or kinetic depending on the relative speed between the bodies. If the bodies are stationary to each other, then the friction is "static"; if the bodies are sliding across each other, then the friction is "kinetic". The static coefficient is usually higher than the kinetic coefficient (it's harder to get something moving than to keep something moving). The frictional force is opposite of the direction of travel. and the friction doesn't exceed the amount of force needed to keep the bodies locked together. The actual friction equation is very simple, but you need vectors normal and parallel to the surface to complete the calculations. Since everything in my simulation is still a sphere, those values are pretty straightforward to determine. 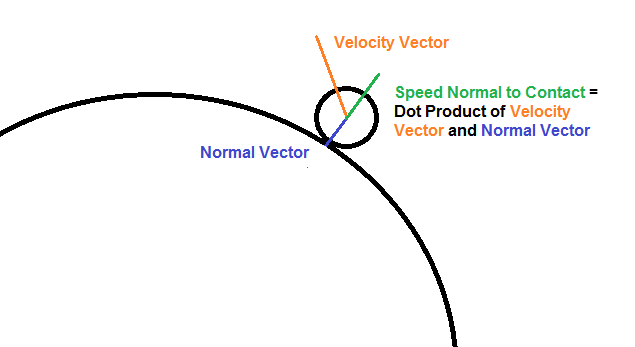 I came up with a couple ways to get the velocity component along the surface. (I'm sure there are many more!) I'm fairly happy with my second approach (please feel free to suggest alternatives!). After getting the normal vector, I use the dot product of the relative velocity and the normal vector to get the speed of the bodies into each other. The resulting speed is a scalar (magnitude only, no direction). 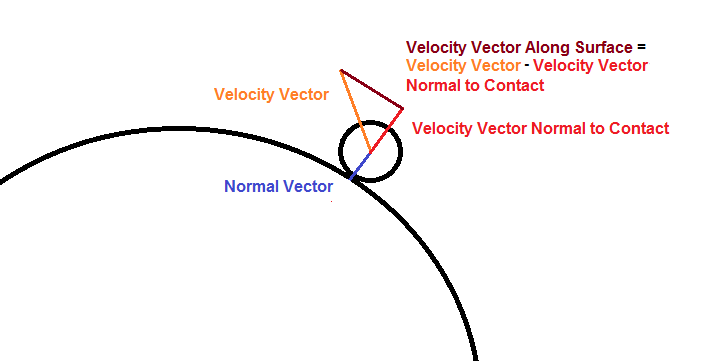 I can multiple that speed scalar with the normal vector to get a velocity vector normal to contact. Finally I can subtract the total relative velocity by the normal relative velocity to get the relative velocity along the surface. 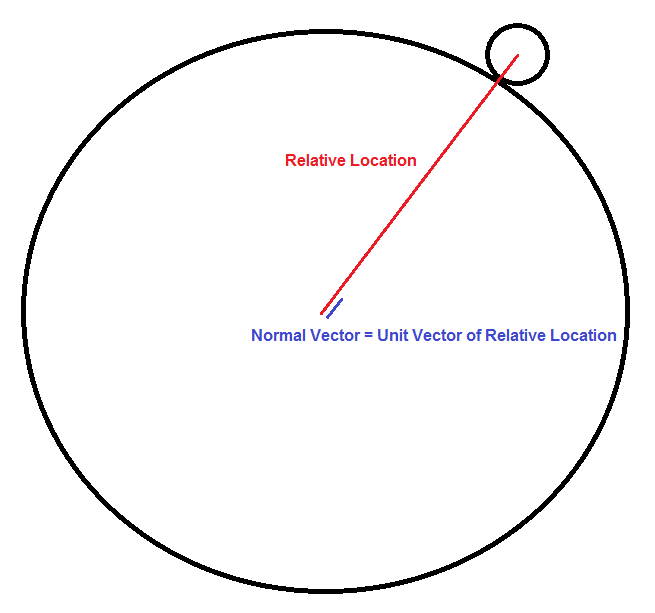 Take the unit vector of that, and we get the motion of travel along the surface! With the unit normal and surface vectors, we can finish the friction calculations. Take the dot product of the relative force and the unit normal vector to get the normal force. The magnitude of the friction force is the normal force * the coefficient of friction. And then multiply that value by the unit vector along the surface to get the friction force vector. Finally add that frictional force vector to the sum of all the other forces acting upon that body. To recap from a previous post, there is an update() function in the OrbitalAeroModel class. I've made some cleanup and optimization changes to it compared to previous posts. The new update function combines Indirect and Direct forces into a single function call. The previous processIndirectForces function has been renamed processForces and it now includes the frictional forces. // thrust, gravity, atmospheric drag, and friction. // Are the bodies in contact? // Friction force is determined by the friction coefficient * the normal force between the bodies. // of our relative distance. 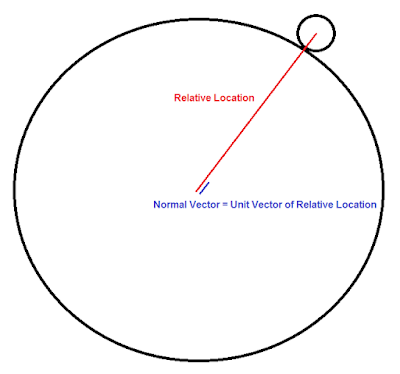 // the bodies and the normal vector to get the surface vector. 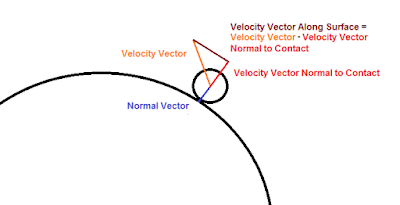 // Get the relative velocity between the two bodies. // Calculate the magnitude of velocity going normal to the surface. 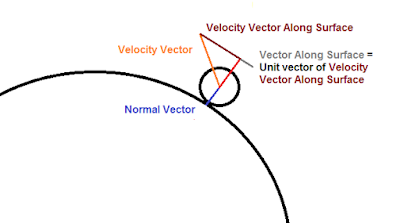 // Calculate the velocity vector that is normal to the surface. // the surface. This vector is opposite of the direction of travel. 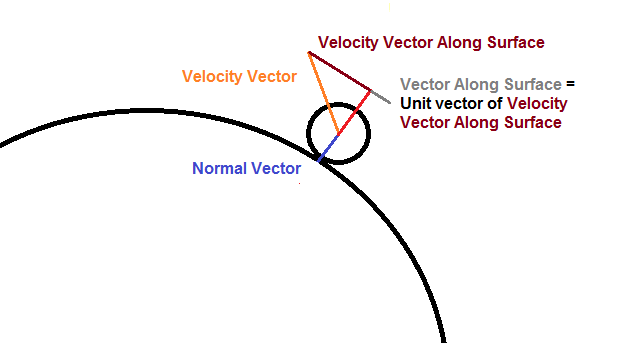 // And the unit vector of our surface velocity gives us the surface direction. // Determine coefficient of friction based on the speed along surface. // Body is moving, kinetic friction. // Body is not moving, static friction. 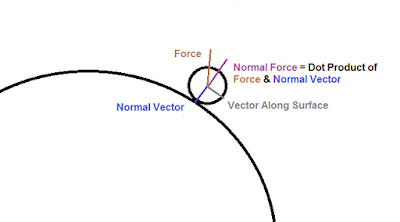 // Friction force is based on the force pushing the two bodies together. // Gravitational force pulling them together plus the thrust of both bodies. // nearby bodies, as they will have an equal influence on both bodies. // Get the force magnitude by taking the dot product of the normal vector with the relative force. // Friction force is applied in the opposite direction of movement along the surface. // Apply friction force to the sum. // Frictional force should be limited to the amount of force necessary to bring the body to a stop. // Friction should also cause the bodies to spin. In this example, a body is just above the Earth falling towards it. It does a short couple bounces (I'll cover that code later), and then friction brings it to a stop. I also tried adding a thrust force down when the body was in contact with the ground; stops sooner. When it comes to the friction code, it could be greatly improved upon in the future. Bodies should have different properties (smooth vs rough), friction should cause bodies to spin, and I'm applying the full static force even when stopped (their friction forces constantly twitch back and forth when stationary). For my purposes now it gives nice results for when objects scrape along the ground.